[%pageBreakSettings nobreak=true] It was while reading Jane Jacobs’ book Cities and the Wealth of Nations that I first considered the idea of "import replacement." She writes about its role in a city’s economy. It has something to do with becoming the local producers of the things we locally consume, and I think it has a great deal of merit. But then, as an urban homesteader, I’ve been thinking about its role in the health of our homes and the environment. In the end, the concepts of import replacement can present themselves in many ways and places. It just happens that I am apt to start in my home and work outward. What brought this all to mind were the store-bought jars, boxes, and bags filling my refrigerator and cupboards despite my food-preservation mania. I can’t seem to get away from them. They’re filled with everything from prepared soup to nuts. Even though I could make or grow these things myself, I still buy them. I understand moderation, but still, given my willingness to cook my way to domestic-import replacement (a k a food preservation), I don’t get why I still have so many cute little and big things in my cupboards. There is nothing new to the concept of buying in bulk and recycling your containers. Just about anyone breathing gets the concept behind co-op groceries, at least as they started out. In the old days, buying in bulk was just about all you could do, since there were relatively few packaged items. These days the co-ops and groovy grocery stores are packaging central. Of course, you can still get around buying stuff in packages, but it’s not all that easy. There’s all that cool design and embedded value marketing to hook you into thinking you're doing a great thing just by buying a tiny box of organic mac and cheese (made with REAL cheese — go figure). Clearly the effort isn't always disingenuous. There are lots of great folks making great food and wanting to make a living doing so. I don't want to hold their efforts hostage to my frustration with mainstream economics; I just want to be careful to see things clearly. There is good and then there is greenwashing. Still, the concept of value-added is neither new nor nefarious. You can get more money from a loaf of bread than a pound of wheat; more from a jar of jam than a pint of berries. And I really get that it is wonderful to have fabulous breads, condiments, and jams coming from honest and sustainable growers and producers. In that way I salute the effort and am endlessly hooked into the beauty and the taste of tiny jars. Add to that the convenience such items add to people's lives, and I understand how it is that pantries get stocked. Still, I’ve been thinking import replacement and urban homesteading and keeping myself busy all winter. So if it means forgoing some of the tastes and conveniences of the market in lieu of making my own everything, then I’m up for the challenge. I’ll start with the easy stuff. Condiments like mayo (sorry, aïoli) are easy. Of course pesto is already in the freezer; I made it this summer with the basil and garlic I grew. I canned lots of tomatoes, knowing they would turn up in sauces and stews throughout the winter, but now I’m looking at recipes for ketchup. I remember making mustard years ago, but I go through so little of it that it doesn’t always make sense. Still, last time I looked they don’t sell Dijon in bulk, but they do sell mustard powder. I’m hopping this year's hot dogs will be topped by this year’s mustard and the sauerkraut I made. As for the hot dogs themselves, I took a class on fancy sausage-making recently but haven't tried to make any at home. I’m still a little shell-shocked from my last experience some 20 years ago. It was a hideous affair. I didn’t have an automatic sausage stuffer, so I sawed off the tip of a plastic turkey baster and wedged it into the neck of the sausage casing. It took hours to poke that ground sausage meat into the casings by hand, but then I was nine months pregnant and wasn’t really going anywhere anyway. I think I had six feet of pork sausage coiled up in a bowl before realizing you had to twist each link as you went along. In the end what I had was 20 split links (actually I think I got the picture after splitting seven or so). I decided to squeeze it all out of the casings and make patties. I never totally got over the disappointment, but I think I’m gonna try again. I’ll just stop short of slaughtering the pig — for now. Then there's the sickly-looking pasta I’m making today. In her book More Classic Italian Cooking, Marcella Hazan advises that it will take time to do it right. Actually, her treatise on the virtue of hand-rolling is quite inspiring. It was right down my alley. Yeah, I thought, machines are for those who don’t want to learn the craft of things. 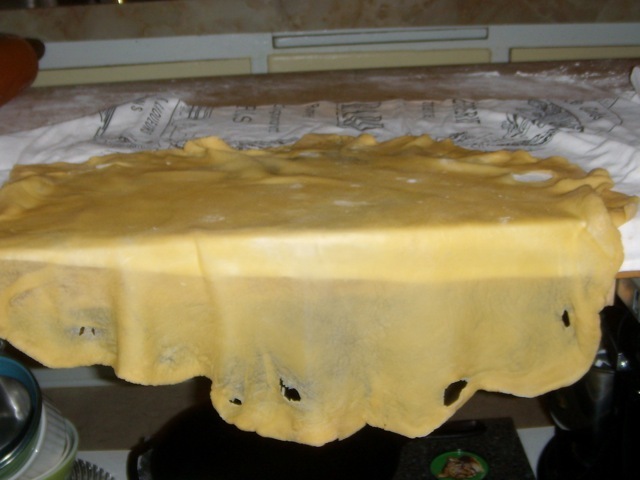 Making pasta might not be blacksmithing, but you've got to start somewhere. So today I’m a little bit closer to being completely overwhelmed, which seems to be my goal. On top of the weekly preparation of bread, granola, beans, and huge pots of homemade chicken stock, I’m taking on pasta. Soon I will tackle condiments and they — along with the jams, pickles, canned fruit, and vegetables of summer — will line the shelves in my fridge and pantry. It will be a great day, I suppose, when I look into the cupboards and see nothing but my own label. In fact, from my little experience on the matter, that might well be half the fun of it. 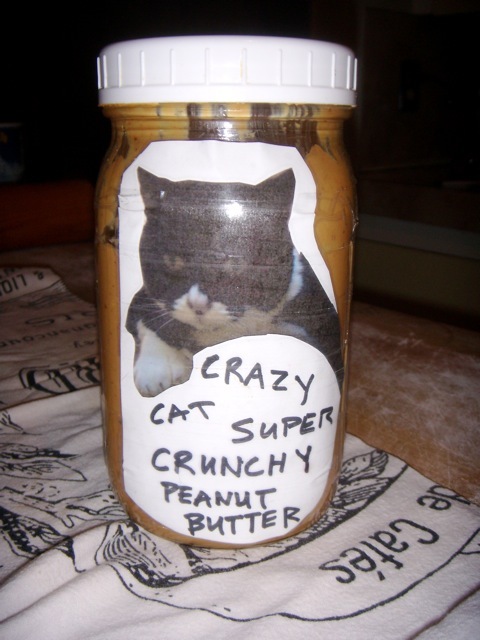 Check out the peanut butter I made the other day. Hopefully kitty won’t mind. I never got a waiver.